VANCOUVER, Dec. 6, 2018 /CNW/ - Mawson Resources Limited ("Mawson") or (the "Company") (TSX: MAW) (Frankfurt:MXR) (PINKSHEETS: MWSNF) provides an update on the Company's drill programs targeting gold and cobalt in Finland and gold in the USA. 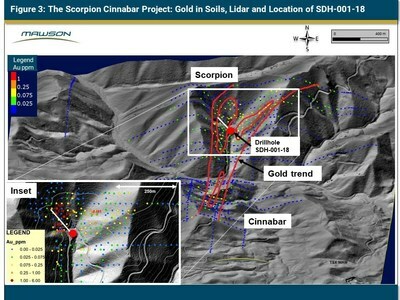 Mr. Hudson, Chairman and CEO, states, "At the WUSA project, highly altered and sulphidic rocks were intersected beneath strong gold anomalies in soils at Scorpion and pathfinder-metal rock chip anomalies at Huckleberry. Such strong alteration is encouraging in these new systems, with results anticipated to be released in Q1 2018. 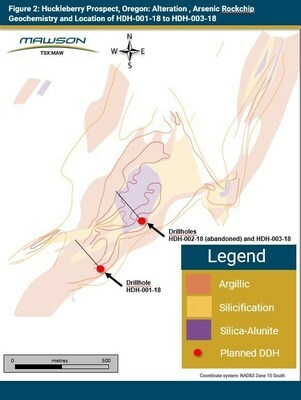 In Finland, although the mineralized host position was discovered in multiple holes at two prospects, the relatively minor structural overprint is interpreted to have limited the development of higher gold and cobalt grades. 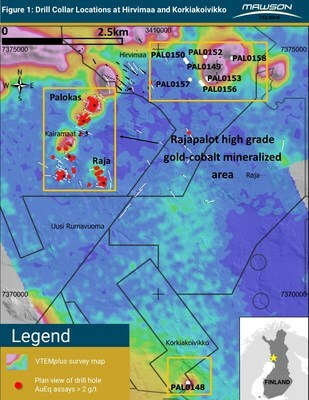 Further work is underway to define targets outside the 3.5 kilometre mineralized trend at Rajapalot, where a maiden resource calculation is being finalized and a 15,000 metre winter drill program (subject to final permitting) is set to begin during January 2019." In Finland, one diamond drill rigs from MK Core Drilling OY ("MK"), with water recirculation and drill cuttings collection systems was used for the drill program. Core diameter was NQ2 (50.7 mm). Core recoveries were excellent and average close to 100% in fresh rock. After photographing and logging in Mawson's Rovaniemi facilities, core intervals averaging 1 metre for mineralized samples and 2 metres for barren samples were cut in half at the Geological Survey of Finland (GTK) core facilities in Rovaniemi, Finland. The remaining half core is retained for verification and reference purposes. Analytical samples were transported by Mawson personnel or commercial transport from site to the ALSGlobal facility in Sodankylä, Finland. Samples were prepared and analyzed for gold and multi-elements at ALSGlobal, gold by method Au-ICP22 (fire assay and ICP-AES, 50 g sub-sample) and multi-elements by ME-MS61 (four acid digest and ICP analysis). At the WUSA project, one diamond drill rigs from Idea Drilling was used for the drill program. Core diameter was HQ (63.5 mm). Core recoveries were moderate and averaged 90% in fresh rock. After photographing and logging in Mawson's Oregon facilities, core intervals averaging 1.5 metres were cut in half at ALS Chemex's facilities in Reno Nevada. The remaining half core has been retained for verification and reference purposes. Analytical samples were prepared and analyzed for gold and multi-element geochemistry at ALS Chemex using the Au-ICP22 and ME-MS61 techniques.The QA/QC program of Mawson consists of the systematic insertion of certified standards of known gold content, duplicate samples by quartering the core, and blanks the within interpreted mineralized rock. In addition, CRS inserts blanks and standards into the analytical process. The qualified person for Mawson's Finnish projects, Dr. Nick Cook, President for Mawson and Fellow of the Australasian Institute of Mining Metallurgy has reviewed and verified the contents of this release.